If you’re the kind of geneticist who wants to know about causative variants that affect selected traits, you have probably thought about how to combine genome scans for signatures of selection with genome-wide association studies. There is one simple problem: Unfortunately, once you’ve found a selective sweep, the association signal is gone, because the causative variant is fixed (or close to). So you need some tricks. This is a short review that I wrote for a research topic on the genomics of adaptation. It occurred to me that one can divide the ways to combine selection mapping and genetic mapping in three categories. The review contains examples from the literature of how people have done it, and this mock genome-browser style figure to illustrate them. You can read the whole thing in Frontiers in Genetics. Johnsson, Martin. 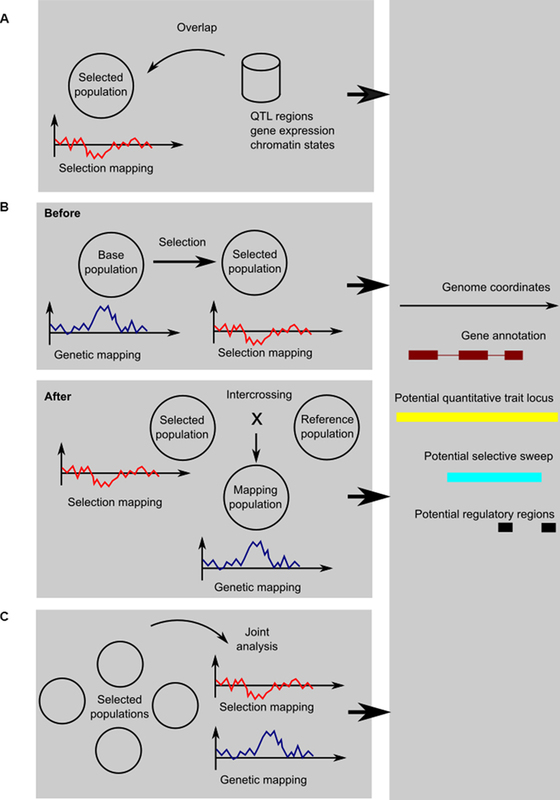 Integrating selection mapping with genetic mapping and functional genomics. Frontiers in Genetics 9 (2018): 603.